Gorilla and human being has something in common that you can see on the physical appearance. The big animal has small ears, 10 toes, 10 fingers, two arms, two legs, 32 teeth and forward looking eyes. Even though human and gorilla have similarities, you can see the big differences on the fur and size of body. The toes of gorillas are big. The whole surface of the body is covered with dark thick hair. The hair is not seen on the palms of hands and feet, chest, face and underarms. 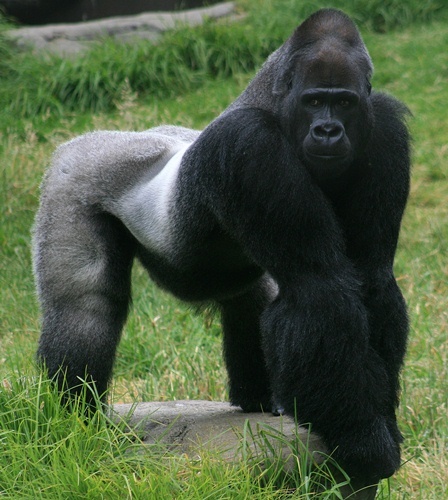 When an adult gorilla reaches the age of 15, the back will turn silver gray and he is fully grown. To show the excitement and aggression, you can see gorilla making a familiar loud sound and beat the chest using the open cupped hand. The animals can stand upright but they do it occasionally. Another animal with similar behavior is explained in Chimpanzee facts. When a baby gorilla is born, it only has a small weight around 4.5 pounds. The baby should be looked after by the mother until it reaches 3 years. The baby needs to stay in the family. 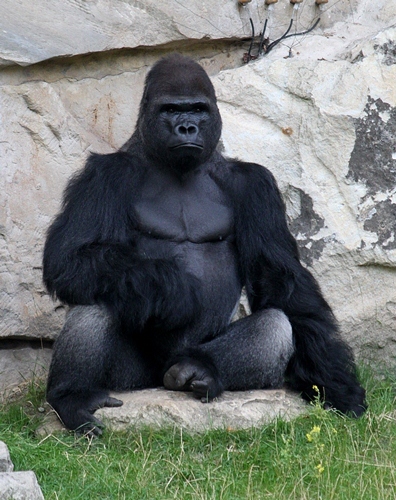 The male gorilla is fully mature when it reaches 13 years and female reaches 10 to 12 years. Gorillas stay in a family group. 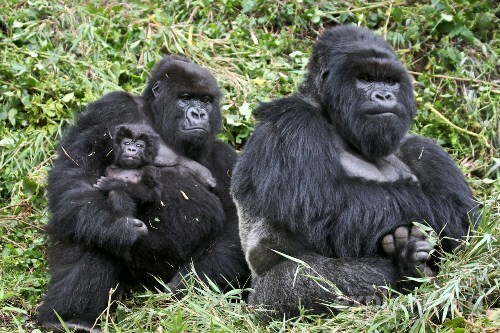 The young gorillas will be taught on how to make a nest, find food, and look after a baby. Most gorillas can live up to 50 years.The behaviour is explained in Jane Goodall facts. 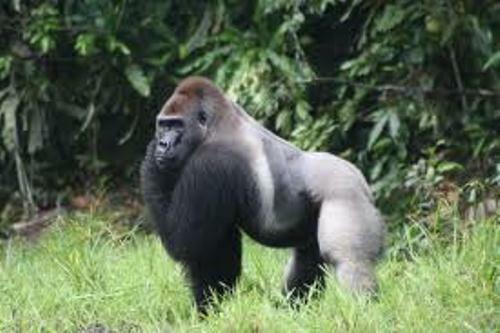 Gorillas communicate with others by using facial expression, body postures, chest clap, vocal sound, odors and drumming. Even though the animals cannot use the human language, they can communicate with us by using the sign language. 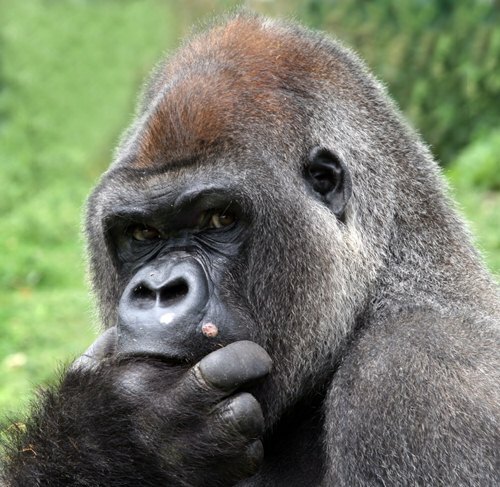 Gorillas are considered as intelligent animals. They can show us the full range of emotion. They know the grief, love, hate, greed, joy, hate, fear, pride, shame, generosity, empathy, shame, and jealousy. When they cry, they never produce tears. They will generate sound. The animals find food to eat every day. Their favorite foods include vainest, bark, bulbs, fruits, shoots, leaves and nettles. They also like to eat worms, insect larvae, ants, grubs and termites. There are three types of gorillas to learn. They are the eastern lowland, western lowland and mountain gorilla. The endangered one is the mountain gorilla. They can be found living in Africa. Gorillas have a good nature. Most of them are peaceful and shy animals. The natural enemy of this animal is human being. In some parts of Africa, some people hunt their meat. Being hunted by human being, gorilla’s population is decreased. The habitat is getting reduced too because of the logging and agriculture. Are you concerned with facts about gorilla above?